Negative Man! Elasti-Girl! Automaton? The Doom Patrol debuted in ‘My Greatest Adventure’ No. 80. Like many fabulous things, the Doom Patrol was born out of desperation. It was late 1962, and DC’s “My Greatest Adventure” faced cancellation. 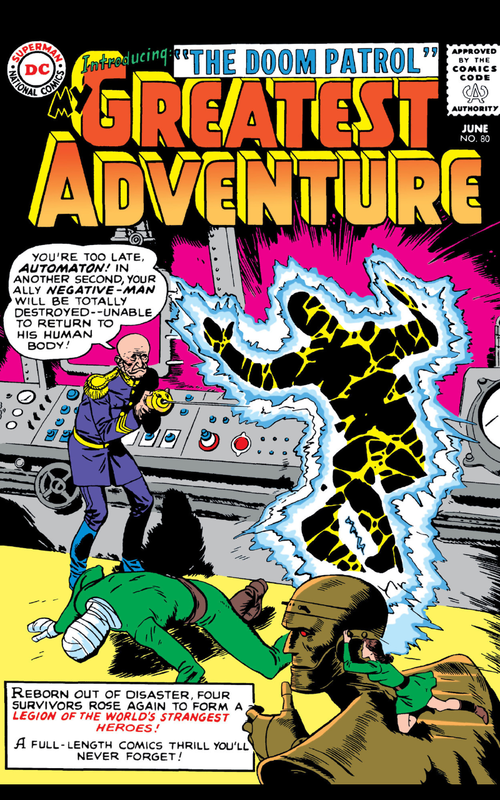 Started in 1955, “My Greatest Adventure” was one of DC’s many anthology books that ran amok with weird sci-fi tales, such as “I Was the Hunted Man-Bird of Mystery Mesa!” (in issue No. 75) and “Cure Our Robot Ruler – or Die” (in issue No. 77). Gee, you’d think with stories like that, the comics would be flying off the shelves. But no. Editor Murray Boltinoff turned to freelance scripter Arnold Drake, who had been toiling on such titles as “Unexpected,” “House of Mystery” and “Challengers of the Unknown,” with a request: Get him some new superheroes for the title. The Incredible Growing Gal: Elasti-Girl shocks her film crew. 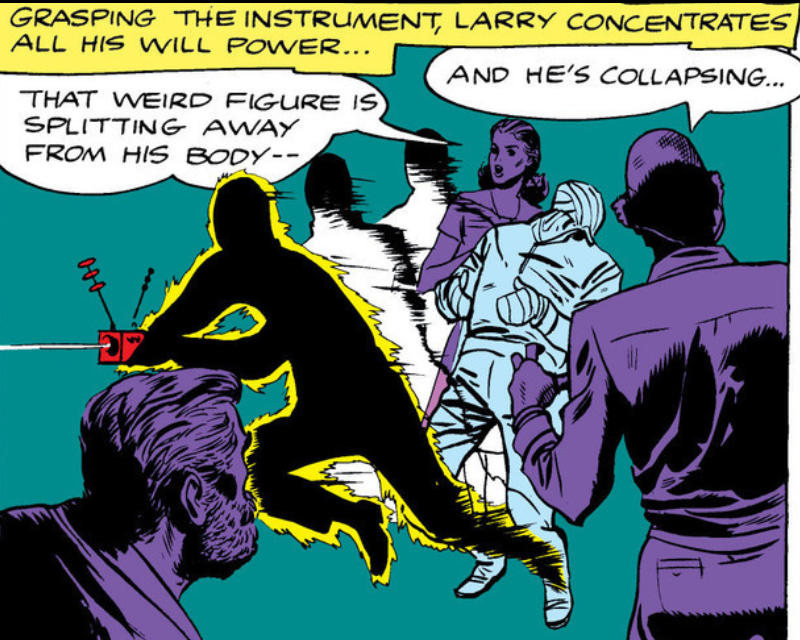 So with help from his pal Bob Haney, Drake created the most unusual group of Silver Age heroes for DC Comics: The mysterious wheelchair-bound Chief; Robotman – Cliff Steele, race car driver whose body was burned to ashes in a crash and whose brain was transplanted into a metal body; Elasti-Girl – Rita Farr, Hollywood starlet whose exposure to weird jungle gases gave her the ability to shrink or grow to dramatic sizes; and Negative Man – Larry Trainor, an ace pilot whose chance encounter with radiation gave him the power to release a dark energy being, but only for 60 seconds. Making their debut in the story “The Doom Patrol” in “My Greatest Adventure” No. 80, cover date June 1963, ” written by Drake and Haney and illustrated by Bruno Premiani, the Chief dropped some tough love onto the strangers. 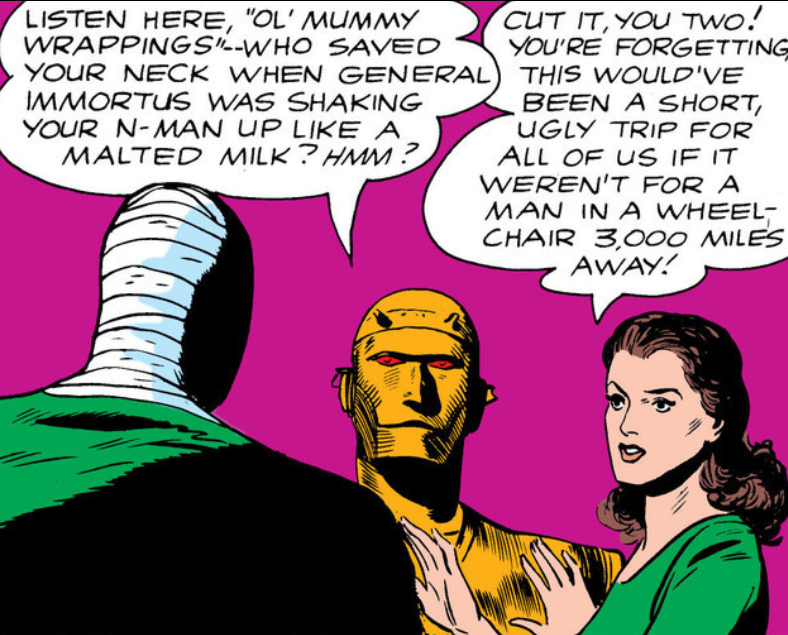 Negative Man makes for one of the best, most distinctive visuals in the DCU. Under the Chief’s direction, Robotman (called Automaton on the cover), Elasti-Girl and Negative Man investigate an alien spacecraft that crashed on the planet and run afoul of one of the Chief’s oldest and greatest foes, General Immortus. In a universe filled with bright, soaring gods – Superman, Batman, Wonder Woman – the Doom Patrol stood out. They were misfits. Outcasts. They hated their powers. Unlike the sunny personalities of the 1960s DCU, they bickered constantly. They wanted more than anything to recapture their old lives. Their foes were the weirdest villains in the DCU, including: The Brain (literally a brain encased in fluid in a large tube); his partner Monsieur Mallah, an intelligent gorilla wearing a French beret; and the Animal-Mineral-Vegetable Man, whose name really tells you everything. Robotman – wearing clothes. He would get over that. Avid readers are quick to note the similarities between the Doom Patrol and the X-Men. Both were lead by wheelchair-bound brainiacs. The Doom Patrol battled the Brotherhood of Evil; the X-Men tussled with the Brotherhood of Evil Mutants. Drake didn’t think so, arguing at one point that Marvel head honcho Stan Lee must have stolen the idea from DC. Doom Patrol launched three months before the X-Men. If they are fighting with each other, all is right in the world. Here’s the strange thing: Hide the company logo and you could be convinced you were reading a Marvel comic book. Much like the Fantastic Four or the Avengers, “Doom Patrol” crackled with interpersonal skirmishes and banter. “Doom Patrol” was a DC book ahead of its time. I first encountered the Doom Patrol in the back of a barbershop. The local barber kept a thick stack of DC comics on hand for customers to read as they waited. Whenever my father would take my brother and me for our cuts, we would both compete – to remain the longest in the waiting area. We zoomed through books. I just speed-read as much DC greatness as I could. For a kid with no money, the trip to the barber was better than a dozen visits to the library. Among the worn titles on that afternoon: “The War Over Beast Boy,” “Doom Patrol” No. 107, cover date November 1966, in which the robot Ultimax gases a giant-sized Elasti-Girl down to microscopic oblivion. She’s actually fighting for her life on a subatomic world within a molecule on Robotman’s hand. My first “Doom Patrol”: Look at that insane cover. How could you not fall in love? It was so kooky and far-out. It was a continued story. Do you know how many years I had to wait to read the conclusion? 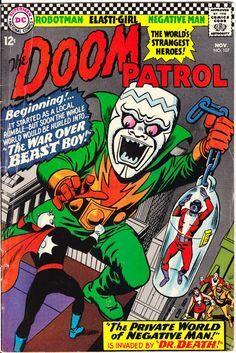 By the time I started getting my own comics, “Doom Patrol” had long been cancelled, in 1968, in a classic story in which our mighty misfits seemingly sacrifice themselves to save the lives of the elderly residents of a tiny Maine town. Sales, you see, had dropped to about 250,000 copies a month. Can you imagine any comic selling so many issues today? 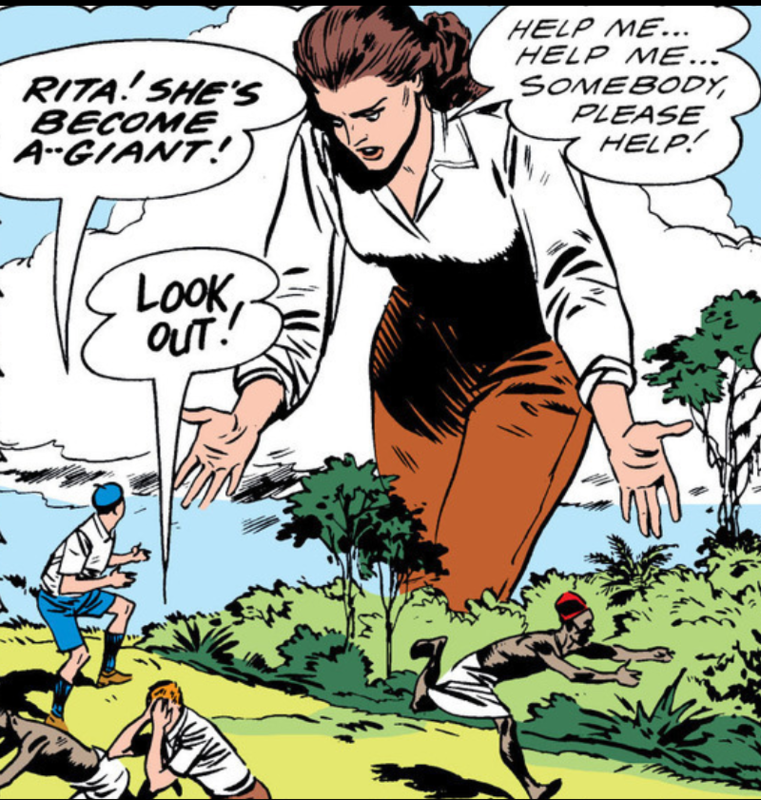 It took me a long time, but I finally found out what happened to Rita on that weird world. 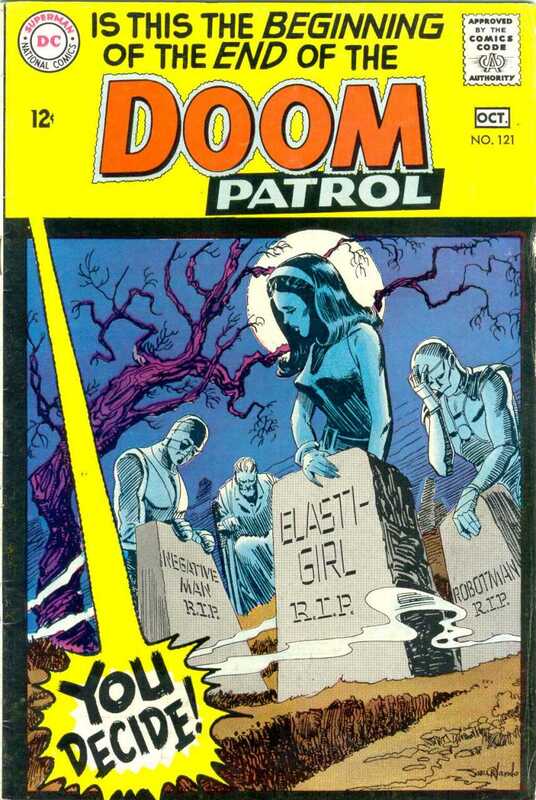 Grant Morrison’s lasting contribution to the Doom Patrol: the heart-breaking and scary Crazy Jane. Over the years, “Doom Patrol” has had more reboots than members, from creators as varied as Paul Kupperberg, John Byrne and Keith Giffen. 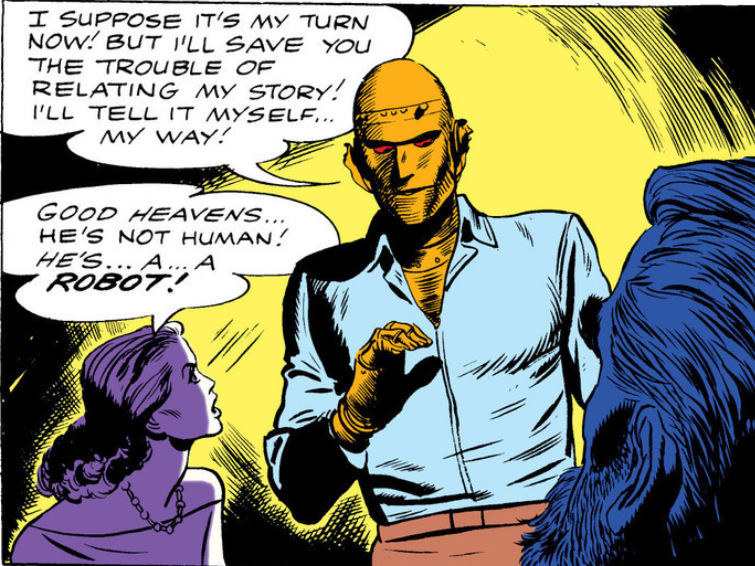 Perhaps the most successful was the Grant Morrison revamp in the 1980s that featured Robotman, a biracial hermaphrodite negative energy creature and a woman suffering from dissociative identity disorder with almost as many powers as personalities. I have huge affection for that run, which came at a pivotal point in my life. DC is once again publishing a “Doom Patrol” comic. It’s another reboot without Rita. It’s another version that misses the point. Maybe. I have all the issues on my slush pile, but I haven’t had the heart to read them. Wow, most titles would kill for half that these days. It really is crazy and sad how sales have cratered over the years. But comics used to be sold everywhere. When I was a kid, I bought mine at a couple of drugstores and at an Air Force base commisary. Now you have to go a specialty shop. And pay $4 for a 20-page story that is being serialized for a trade. Yeah, I’d pick up copies of JLoA and Green Lantern at a local newsagent; only trouble was, they had no control over what they had delivered to them or when. Over here in the UK, in the early 80s, American comics were basically used as fillers in crates holding larger consignments and then just distributed almost at random. So while I found a handful of Crisis on Infinite Earths issues in a newsagent, it took me years to get the rest of the series! That sounds insanely frustrating, Gary. Some titles are worth the hunt, and Crisis was certainly one of them. Can’t say that for a lot other ’80s titles.